Founder and Artistic Director of Festival Ballet Theatre (FBT), Salwa Rizkalla has devoted timeless energy to advancing and promulgating ballet as an art form. Her training in the Vaganova method and studies under masters from the Kirov and Bolshoi have translated to her students who have garnered many prestigious awards and launched professional careers. Because of her exceptional track record, Ms. Rizkalla has also been able to attract guest artists to perform alongside her company. Le Corsaire Suite and Mixed Repertoire is a mélange of music and movement while much of the weight is placed on the ballet Le Corsaire with good reason. Le Corsaire is a bit of an anomaly in that choreographer Marius Petipa made many revisions to it throughout the 19th and 20th centuries. Because we are witnessing a dissection of the complete ballet, the story’s plot is not altogether understood (unless one reads the program), but that’s really not the point. Instead, it is the vehicle by which every cast member shines and demonstrates his/her abilities. In a sense it’s a mini showcase recital. In some pieces Ms. Rizkalla “layers” the stage helping the audience to subtly delineate the dance academy’s class levels; this approach is aesthetically thoughtful. The director apportions movements to form her own Suite such as Adam’s (by way of Delibes’) Valse de Naïla, performed with delicate repose, the serene Andante, and the corps de ballet’s delightful Le Jardin animé where all are ensconced in vibrant violet-red attire. Petite Megan Yamashita is a solid and assured Gulnare. 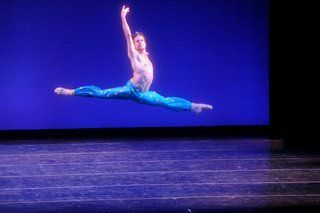 Likewise, the opening number’s pas de trois, including AJ Abrams, Jason Glover and Edgar Nikolyan, sets forward momentum. The Le Corsaire Suite is not without an exciting appearance of renowned José Manuel Carreño as Ali and Miami City Ballet’s Principal Dancer Jennifer Carlynn Kronenberg in the role of Medora. Mr. Carreño’s solo passages affirm his well established qualities: top form, tight turns, assured footing, and a crisp, polished grand jeté en tournant. The lithe Jennifer Carlynn Kronenberg gives us great joy watching her solo stints. The good chemistry surrounding Carreño and Kronenberg makes their pas de deux the pinnacle of the evening. A last minute insertion captures Mr. Carreño’s obliquely fluid movements set to the music of Shubert’s Ave Maria while a variegated Gershwin Fascinatin’ Rhythm provides a lighter fare featuring Ms. Kronenberg doing some sassy stepping from Balanchine’s Who Cares?. Nicole Vitale and Edgar Nikolyan have a splendid connect in the the Valse Fantaisie amidst the keenly synchronized background movements of Tyler Donatelli, Ashley Ike, Mariah Vega and Megan Yamashita. At a later date it would be advantageous for FBT to revisit the audio department: the speaker volume is way too high, causing distortion and the clarity of music isn’t sharp enough.